It’s no secret that schools and teams like to market their product. For schools it’s their education and for teams it’s there history of competing. Both of these are very marketable products. There are a lot of schools and teams who market themselves and often times fail. Using people’s sense of wanting to belong to something is the mere reason spirit wear and team sales are successful. These days it’s impossible to go to the local grocery store and not see a few t-shirts and sweatshirts with local school logos printed on them. The same can be said for a local sports team weather it’s a softball club, a soccer club, or a hockey club. Do you have any idea how much revenue comes in from t-shirt and jersey sales for every major professional sports team on the planet? It’s huge and a very large part of their revenue. Why? because they have a product people want to wear, want to show off, saying they belong to this team and this city. Private schools, public schools, grade schools, high schools, colleges, there is nothing different here. These are just as marketable products as major professional sports teams. Perhaps on a smaller scale but profitable nonetheless. The key is to market your product in a profitable way. Kirkwood Trading Company has been printing custom t-shirts for a very long time. A large percentage of our clientele is schools and sports teams. All sizes, all shapes and sizes, all demographic backgrounds. 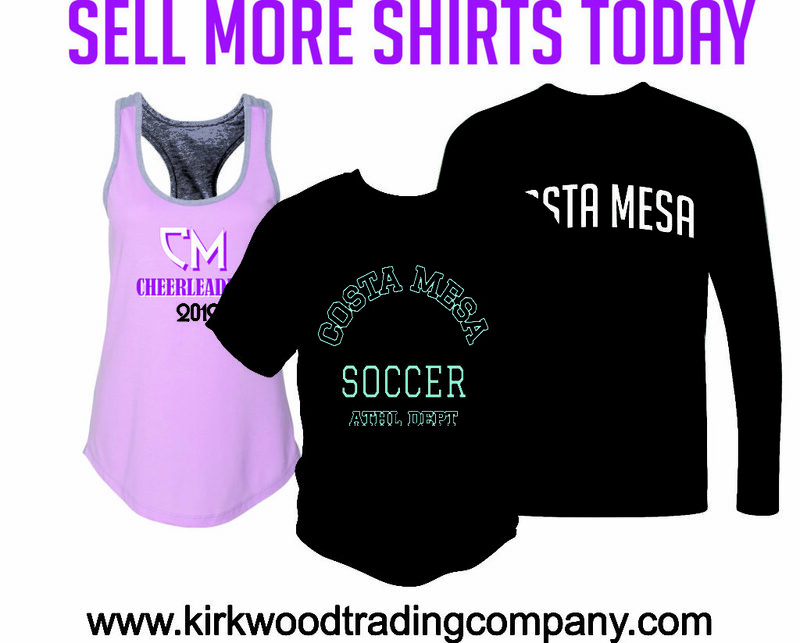 We help our clients make more money through their spirit wear sales and team wear sales. The best part if it’s absolutely free. Our favorite phone call: Hello, I’m calling from a local school and we are thinking about selling spirit wear this year. We haven’t done it in a couple of years and when we did, sales weren’t good. Spirit wear sales fail for one reason. The products that the school are selling aren’t products people want to buy. This could be because the shirts they sold were not good quality or the designs on the shirts were very basic and boring. In order to sell more shirts today you have to be willing to listen to people who are experts in producing shirts. We know the trends, we know what designs work, what shirts people are interesting in buying, and we know what sells. So we will be happy to give your spirit wear a face lift. However we will go beyond that and put you in a position to be successful. Most schools don’t realize that sales come from two places. An event or store located at the school with a physical location. The other is online with online becoming more and more popular each year. Kirkwood Trading Company will help you sell more shirts today for a few reasons. 1. We are going to look at your current situation and see how you have done things in the past. Do you need a school store on site? An online store? Both are good options for larger schools. For smaller schools and online store is all you need to be successful. For smaller schools the savings comes right away because we do away with costly upfront inventory. For larger schools like high school and colleges where they have a school store we’ll beef up what you are selling with new trendier items and designs. 2. We’ll build you a completely custom online store for FREE. We’ll also run the whole thing and handle shipping and deliveries as well. This eliminates time and hassle for your teachers or parent volunteers. No more hassles with paper order forms. 3. Once the store is built it’s your job to promote. However we handle everything else so you can go about your day knowing someone else is handling the spirit wear. Sell more shirts today. It’s easy. Kirkwood Trading Company does all the work. You simply collect the profits. If you are a team sport, we’ll build you a custom team store with products too.